Migrating is more than just filling in forms and submitting paperwork; its a complex process that will test even the most resilient of people. Understanding Australia & New Zealand at a grass-roots level is paramount to your immigration survival, and to give you a realistic view of both countries, its people and how we see the world, as well as updates about any current or imminent policy changes, subscribe to our regular blog posts by entering your details below. This week I’ve been part of a group of Advisers pulling together a submission to take to government on the proposed changes to work visa policy. I am never quite sure whether it is worthwhile making submissions to an ideologically driven government that has certain ideas in its political head not supported by any real evidence but I've decided to chip in anyway given the importance of this issue. What is really disturbing about the proposals is they seem to be predicated on the misguided belief that there is rampant exploitation of migrants in the labour market and therefore employers look likely to be forced to apply for accreditation with the government before any work visas can be filed. In essence, prove you are a good employer. Accreditation effectively means the government trusts that employer to do what is right by New Zealand, New Zealanders and any migrants they might be allowed to employ. On paper it's not a bad idea but in 30 years of dealing with immigration matters a good idea given to a bunch of bureaucrats to operationalise normally ends in tears. I would make two very strong points to government. Show us the evidence that migrant exploitation in the local labour market is so rampant it requires an overhaul of rules that seem to have served New Zealand's interests without leading to exploitation of migrants pretty well for 30 years. Show us the evidence! I am not suggesting there aren't isolated issues but my advice to the government would be to focus on those industries including hospitality, farming, tourism and aged care. Do not make it harder for the vast majority of employers to fill vacancies in a labour market where we are creating thousands of jobs a month more than we can fill locally. One of my suggestions as part of the submission process is that the government knows full well which industries and what sorts of businesses see isolated issues with ripping off of migrants. Surely, rather than taking the sledgehammer to the walnut and imposing an onerous process on the 95% of employers who act with honour and integrity, government should come down hard on, or perhaps create a separate work visa process for those industries where some credible independent evidence of exploitation might be proven. The reality is any employer looking to support a work visa application today is required to present a lot of information about their workplace practices, employment history, financial viability and sustainability. Compliance checks I would argue are already rigorous enough to act as a disincentive to those employers who might be inclined to either rip off the system or a migrant. Although it is lost on governments of our current persuasion, adding a disincentive to the significant majority of good employers who appreciate that the only real asset any of them have is their staff, is insane and an absolute overreaction. The second point is that the immigration department is great on overpromising and under delivering. No doubt they will sweet talk the government on their ability to process all of this in a timely manner which will keep employers happy, protect vulnerable migrants and deliver on the government’s misplaced obsession about protecting migrants from exploitation. B-S they will. 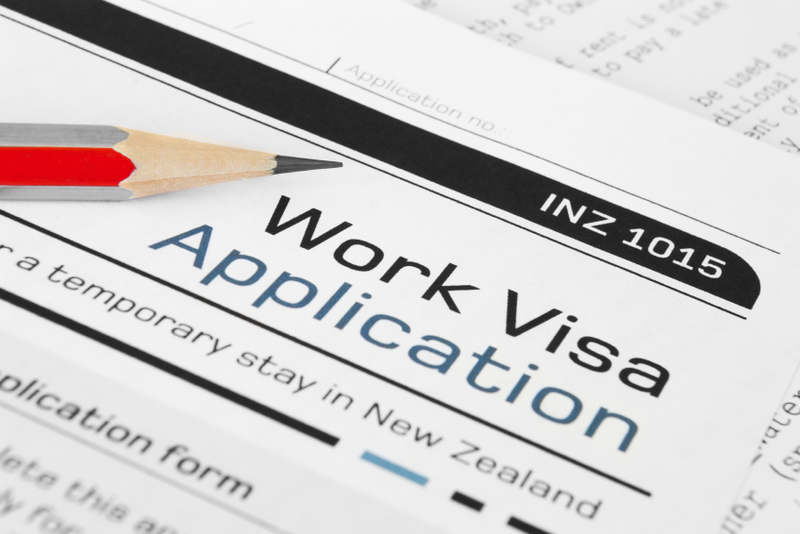 Most branches of Immigration New Zealand today are quoting eight weeks before a work visa is even allocated for processing and another 6 to 8 weeks to process the actual visa. Before any of IMMagine's clients freak out the overwhelming majority are processed far more quickly than that because we know which phone numbers to call. There is no way if these processing times become entrenched, or added to, because employers will have to file separate accreditation applications before a work Visa can be filed, that employers are going to employ migrants in the numbers they are today. New Zealand's unemployment rate today is 3.8%. One of the discussion points that came out of this week’s meeting of Advisers, is that of the 110,000 odd people who are seeking work (apparently) the majority are basically unemployable. Interestingly this is not just because they lack the skills to fill the jobs being created but primarily because of mental health or substance abuse issues. What is clear is that skilled unemployment in New Zealand is effectively zero if not negative. We are still 40,000 construction industry workers short if you can believe the government. We are still several thousand Teachers short. Why does the government want to make it harder for Schools to employ teachers or small construction companies to employ carpenters, plumbers and electricians? The proposals start to look a lot like what Australia does which has led to a very rapid decrease in the number of employers being willing to play the work visa game and which impacts directly on the economic growth and future prosperity of Australia. Like New Zealand, Australia has a low unemployment rate and this was trending down even when work visas were trending up. There is almost no link between the two. We should not make the same mistake. In the discussion paper the Minister, without quoting or providing any evidence to back it up is of the belief that there is "some evidence" that migrants displace local workers. It is worth noting the same discussion paper also quoted international studies which state the exact opposite but why let a few facts get in the way of ideology? Again, to the Minister if he might be reading this, show us the evidence. I have never in 30 years of practicing as an immigration adviser come across a single employer who does not want to employ a New Zealander first. There is also no evidence I am aware of, given our rigorous and wide ranging legal and other protections, that migrants are pushing down local salaries or incomes. The current Government cabinet is full of Ministers who are either ex union officials or people who have never run their own business. They are well-intentioned people who do not understand the realities of making sure that there is one dollar more in the bank account at the end of the week than there was the beginning. They seem to be people who believe that all employers see their staff as chattels to be used and abused without understanding that without those workers the boss doesn't have a business. I know I am going to receive a flood of emails now from current and potential clients asking me if New Zealand is closing the door to skilled workers. To them I would like to say no, that is not the intention, however as they say the road to hell is paved with good intentions. The immigration system is full of moving parts. Every time you tinker with or change wholesale one part of immigration policy it affects some other part of the system in a way most of the bureaucrats and politicians simply don't understand or cannot predict. Typically, in this discussion paper, there is no acknowledgement of that. Further illustration to me, if any was required of an obvious lack of understanding, on the predictable impacts these proposals will almost certainly have on the skilled migrant category if they go through. If we now create further disincentives for employers to employ migrant workers then the government will continue to undershoot its skilled migrant residency targets which are already 30% below what the government claims they want. The government is already, rightly, coming under severe political and polling pressure for promising to build 100,000 "affordable" houses in its first 10 years in office. Anyone with three brain cells knew it was either a lie or they were on drugs when they came up with the policy. They said they would build 1000 in the first year. So far they haven't delivered a third of that. Although there are a number of reasons why it's not possible, one of the most significant is that employers simply cannot find enough skilled workers locally to fill these roles. They rely on migrants. If the government is going to make it harder by creating disincentives to those employers to recruit and employ migrants there'll be even less houses built than the government promised. And they might just end up with one term and power. The fact that we need skilled migrants and we let employers effectively determine who gets in by making the migrant find skilled work, making the process more complex, onerous and time-consuming for the employer when the overwhelming majority of them demonstrably value all their staff equally, whether migrant or local, seems to be lost on these politicians and shows how out of touch they really are. Ehsan Mohammadi commented on Work Visa Changes on the Way on April 20, 2019, 5:05 a.m.
Lindiwe. Mgabhi commented on It's Time to Fix the Broken Skilled Migrant Category. on April 19, 2019, 8:59 a.m.
Mariska commented on Australian Immigration Changes: Much Ado About Nothing on April 19, 2019, 2:01 a.m.
shaun reid commented on NZ Labour Shortage: Emergency Declared on April 15, 2019, 5:36 p.m.
Iain commented on NZ Labour Shortage: Emergency Declared on April 13, 2019, 8 p.m.
Kunedzimwe Godwell commented on NZ Labour Shortage: Emergency Declared on April 13, 2019, 8:03 a.m.
Iain commented on NZ Labour Shortage: Emergency Declared on April 13, 2019, 2:53 a.m.
Iain commented on NZ Labour Shortage: Emergency Declared on April 13, 2019, 2:47 a.m.
Quinton commented on NZ Labour Shortage: Emergency Declared on April 13, 2019, 2:33 a.m.
Habib ahasan commented on What Am I Doing Here? on April 12, 2019, 8:59 p.m.